Rukka D3O Air Armour - Knee. This D3O armour is so much more comfortable than the original open grid air armour in my Rukka trousers. I don't know how it is done, but they are great. A worthy upgrade to fantastic riding kit. Rukka D3O LP1 Knee Protector Set. Fits Rukka Coriace-R and Suki Pro. Universal lightweight impact dispersing CE certified D3O knee armour. D3O impact protection construction. Rukka D3O LP1 Shoulder Protector Set. Fits Rukka Markham, Coriace-R and Suki Pro. Universal lightweight impact dispersing CE certified D3O shoulder armour. D3O impact protection construction. 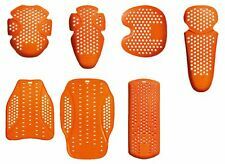 Rukka D3O LP1 Hip Protector Set. Fits Rukka Coriace-R and Suki Pro. Universal lightweight impact dispersing CE certified D3O hip armour. D3O impact protection construction. Rukka D3O Air LP1/CP1 Elbow Protectors. D30® Air is a patented protective material that combines enhanced chemistry with product engineering to produce high performance shock absorption and impact protection solutions. Rukka D3O LP1 Elbow Protector Set. Fits Rukka Markham, Coriace-R and Suki Pro. Universal lightweight impact dispersing CE certified D3O elbow armour. D3O impact protection construction. D30 Airis a patented protective material that combines enhanced chemistry with product engineering to produce high performance shock absorption and impact protection solutions. How D30 Air works D30 Air does not go hard when hit, the molecules lock together to absorb and spread the force, significantly reducing the effect of impact. RUKKA D3O Knee/Shin Protector set. D30 Air is a patented protective material that combines enhanced chemistry with product engineering to produce high performance shock absorption and impact protection solutions. Patented, CE approved and breathable protector D30 Air is a patented protective material that combines enhanced chemistry with product engineering to produce high performance shock absorption and impact protection solutions. A brand New D3O Air material has been developed especially for the Rukka protectors. This New material has some unique characteristics that provide enhanced versatile and flexible protection. Rukka D3O CP1 Chest Protector Set. Lightweight impact dispersing CE certified D3O chest armour for the Rukka Forsair Pro or Kallavesi. Fits Rukka Forsair Pro or Kallavesi. D3O impact protection construction. RUKKA D3O Shoulder Protector set. D30 Air is a patented protective material that combines enhanced chemistry with product engineering to produce high performance shock absorption and impact protection solutions. RUKKA D3O Elbow Protector set. D30 Air is a patented protective material that combines enhanced chemistry with product engineering to produce high performance shock absorption and impact protection solutions. Rukka D3O Air Armour - Shoulder. D3O protectors are soft, flexible, lightweight and comfortable for perfect positioning. CE approved level 1 protector with D3O technology. CE approved level 1 shoulder armour. DESCRIPTION Chest and back protector Stretch Cordura shell fabric Outlast® lining with temperature regulation A connecting zipper for trousers PROTECTORS Chest protector PPE directive (89/686/EEC) Full back protector EN 1621-2 2014 level 2 Sizes S - 3XL. D30 Air is a patented protective material that combines enhanced chemistry with product engineering to produce high performance shock absorption and impact protection solutions. Heated Clothing Jacket Trousers Gloves Socks(or) Insoles. RUKKA D3O AIR SYSTEM Patented, CE approved and breathable protector D30 Air is a patented protective material that combines enhanced chemistry with product engineering to produce high performance shock absorption and impact protection solutions. A brand New D3O Air material has been developed especially for the Rukka protectors. This New material has some unique characteristics that provide enhanced versatile and flexible protection. Rukka D3O Air LP1/CP1 Shoulder Protectors. D30® Air is a patented protective material that combines enhanced chemistry with product engineering to produce high performance shock absorption and impact protection solutions. Moto Central: Rukka Forcefield Back Protector. Rukka Forcefield Back Protector. D30 Air is a patented protective material that combines enhanced chemistry with product engineering to produce high performance shock absorption and impact protection solutions. Body Armour. The story so far: In 2004, Keith a biker for many years decided to buy a new bike. D30 AIR ALL BACK protector Level 2 D30 Air is a patented protective material that combines enhanced chemistry with product engineering to produce high performance shock absorption and impact protection solutions. A brand New D3O Air material has been developed especially for the Rukka protectors. This New material has some unique characteristics that provide enhanced versatile and flexible protection. D30 Air is a patented protective material that combines enhanced chemistry with product engineering to produce high performance shock absorption and impact protection solutions. The story so far: In 2004, Keith a biker for many years decided to buy a new bike.